Genus honouring Julien Marnier-Lapostolle (1902-1976), French botanist and explorer, owner of the famous French orange-flavoured liqueur “Grand Marnier” (see portrait above, cWerner Rauh). Monospecific genus of climbing and spreading vigorous epiphytic plants, with phylloclades having very long and fine lobes. Areoles between lobes. 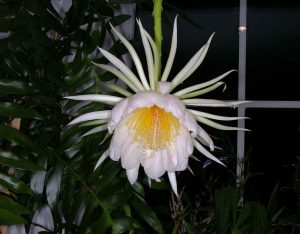 Flowers nocturnal, large, self-sterile, with long tube, white, strongly perfumed, styles of the stamens bright yellow, with outer tepals purple, with the ovary bearing bristles, usually pollinated by moths, and also seemingly by bats. Fruits densely spiny, globose, green to grey and with a juicy pulp. Seeds not known. The monotypic genus Marniera grows epiphytically, covering the branches of trees in rainforests, at low altitudes (not precisely recorded), together with ferns, orchids, bromeliads and other epiphytic cacti, endemically, in an extremely reduced area (less than 1km2) in the state of Chiapas in Mexico. It was also observed in Tabasco, and it is therefore likely that its distribution area is more widespread, but is probably underestimated for now.